For the last several months, I have been trying to determine the origins of each of my mother’s Irish ancestors. In a previous post, I mentioned my success in locating the origins of my Kenefick ancestors; however, I have been having trouble with some ancestors with much more common surnames. 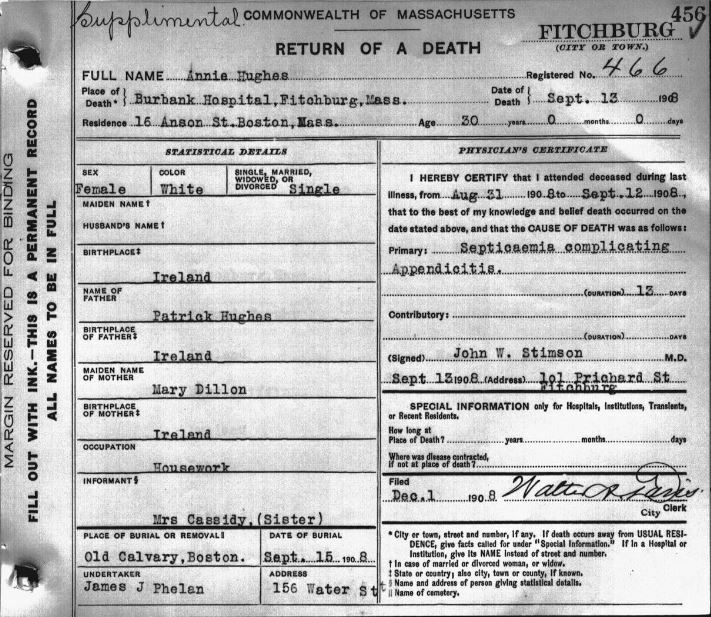 The earliest record I have for my maternal great-great-grandparents Patrick Cassidy and Mary Hughes is their marriage record, dated in Boston 28 November 1888. According to the record, Mary Hughes was the daughter of Patrick and Mary Hughes; her death record further indicated that she was the daughter of Patrick Hughes and Mary Dillon, but when I searched Irish baptism records, there were still several women named Mary Hughes who could potentially be my ancestor. I then turned to my coworker, Irish expert Eileen Pironti, for assistance in finding my Mary Hughes. She suggested focusing on seeing if any siblings of Mary’s came to America, and searching databases, such as our database Massachusetts Vital Records, 1850-1910, using specific parameters: search for the Hughes surname along with the full names of Mary’s parents. Following her advice, I searched Massachusetts Vital Records, 1850-1910, and Massachusetts Vital Records, 1911-1915, for anyone with the Hughes surname with the parents Patrick Hughes and Mary Dillon. I located two death records, the first for an Annie Hughes, age 30, who died in Boston 13 September 1908. Annie’s address is listed as 16 Anson Street, the same address where my Cassidy family was residing at the time of the 1910 Census. The second death record I found was for a Margaret McMahon, daughter of Patrick Hughes and Mary Dillon of Ireland, who died in 1914. 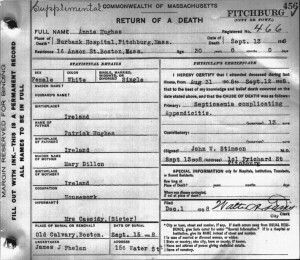 Based on these death records, Eileen’s suggestion was correct: several of the siblings of Mary Hughes had left Ireland to come to Massachusetts. In locating the birthplace of Mary Hughes, the real break came with her brother, Patrick Hughes. A Patrick Hughes, son of Patrick Hughes and Mary Dillon, married Elizabeth Agnes Green in Needham, Massachusetts, on 18 September 1899. As a man, Patrick was more likely to naturalize than his sisters Mary, Annie, and Margaret, so I tried to locate a naturalization petition for Patrick. I found Patrick, who naturalized in 1896, listing his birthplace as County Mayo, Ireland. Going back to Irish baptism records, I was able to locate a Patrick Hughes and Mary Dillon baptizing children in the Kilcommin and Robeen Catholic parish in County Mayo. This Patrick and Mary (Dillon) Hughes had nine children, including Mary, Patrick, and Margaret. As Hughes is such a common surname, I am very fortunate that several of Mary Hughes’ siblings came to Massachusetts as well, helping to narrow my search. Looking at an ancestor’s siblings is always helpful, and the siblings of immigrant ancestors can provide additional information on your ancestors’ origins. very good post and great reminders to keep looking! Happy Thanksgiving Katrina. Katrina, Great post! Got to love those siblings. What better way to find or prove out a mysterious or even a dubious family line? “The siblings” have helped me many times to verify out information I could not otherwise show as true. Many thanks for confirming my belief in this. Enjoy your holidays! Thanks! I love to hear of people who have success in tracing their Irish family back to the old country! I have 6 siblings with the last name of Morgan born from 18274 – 1835 somewhere in Ireland who appeared in Charleston, SC right after the 1850 census and left tracks all over town – but none that led back to Ireland. Thanks – really – for giving me another glimpse of hope! Spot on! And it’s not only the Irish–any immigrant group, with its fluid names, ought to be looked at as a whole. Good information – thank you! Thanks for this reminder to stay UN- focused in Irish research. I also had the good fortune to break a brick wall upon discovering a male sibling and his Naturalization papers. Now, if the winter is slow for me, it is on to the Catholic Archives to hopefully bust through the second to last wall in my Irish mystery bag. I have had the same success by looking at relatives, but this time it was in Great Britain. It seems like a sibling of my ancestress, Jane Mary Patterson, had a brother James and looking at all his records of his family in Quebec made me realize who his ancestors were in the parish of Saint George in the east in middlesex England, and likewise what Jane’s parents were. It was one of the biggest breaks of my life. Because family history and seven unsuccessfully trying to find her ancestors for over 35 or 40 years. Finding all the records for the siblings of my Irish great grandfather enabled me to find his father’s correct name (entered wrong on the marriage record) and where they lived before coming to the US (It was in the obits for 2 of the 3 siblings.) Collateral research is key for Irish research. It makes me want to cry when I see the identity of women erased this way. For some of my female ancestors, I have not even been able to find a first name: they are ciphers in the records, even of family. In a few cases, I have been able to find out their names through court records. But for some, not even the registration of the births of their children include their names– only the fathers. These women are my ancestors in multiple ways, not merely possible genetic inheritance, but as carriers of our cultural heritage– a large matter in who we are. I had a similar breakthrough of a long standing wall when I discovered the Intention to Naturalize of my grandmother’s sister in which she gave the family’s real last name. They had hidden their Jewish ancestry even from their children. I discovered this technique years ago when tracking an ancestor William Johnson. Luckily, He usually used his middle initial “G”, and he migrated with his family. One of his brothers’ names was Salem Johnson and an uncle’s name was Cyrene Johnson. Definitely a help with these common surnames! Researching siblings also helped me break down a longstanding brick wall in my Irish ancestry as well. I had traced my great-great-grandfather Charles Boyle to Philadelphia city directories for 1885 through 1887, after which he moved to Wilmington, Delaware. He had married in 1881, so there were numerous possibilities for him in the 1880 Census. But after Charles left Philadelphia, at the same address there was residing a Patrick Boyle, who was a barber like Charles. Patrick’s marriage certificate gave his parents’ names and led to suburban Phoenixville, where the 1860 to 1880 censuses confirmed that they were brothers.